Several SOTA activators have commented recently on the fragility of squid poles and I thought it might be timely to share my preferred method of antenna rigging for SOTA Summit activations. My portable antennas are (1) a linked dipole for 7, 10 and 14MHz and (2) a linked wire for 14, 18, 21, 24 and 28MHz that I put up as a vertical fed against a set of ground-plane wires lying on the ground. Either of these antennas can be supported using the method described here. My area of operations is generally within a couple of hours’ drive of my home in Albury, and takes in much of the NSW Riverina (VK2/RI) and Victoria North East (VK3/VE) SOTA regions. Summits in this part of the world are, by and large, forested and often have trees within the activation zone. There are exceptions of course and I do have a solution to those, but for the moment let’s focus on the Summits that have trees on them. How do you know if a Summit you’ve never visited before has trees on it? 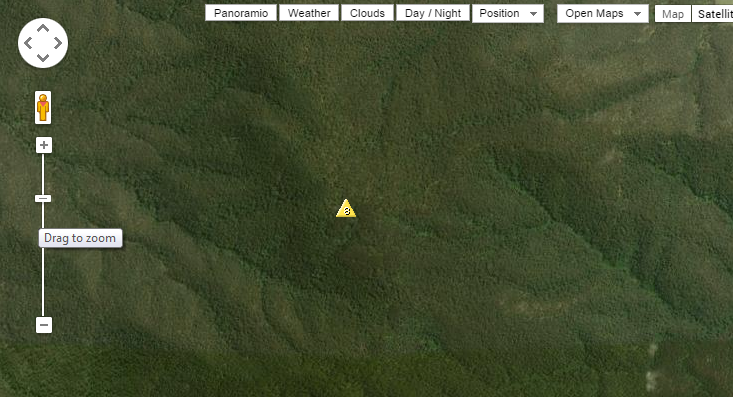 The SOTA Mapping Project is a good place to look. You’ll soon see from the satellite imagery whether the area is forested or not, and you can generally get an idea of the type and size of the trees. Also, you might check out the blogs of Activators who have been there before you. 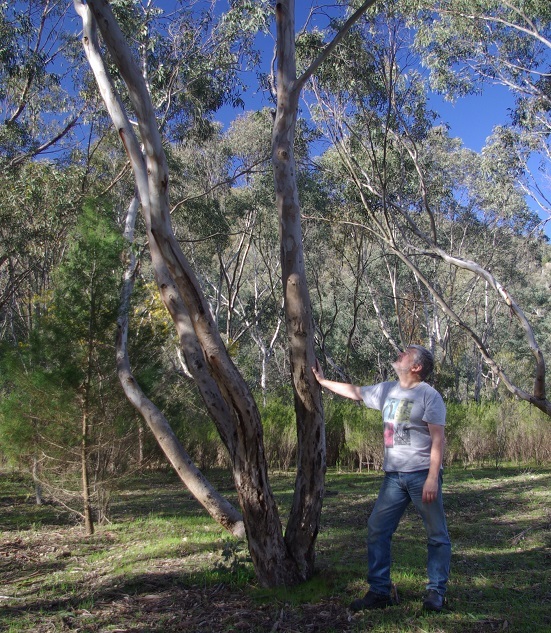 The ubiquitous Aussie Eucalypt comes in all sorts of shapes and sizes, from the short and stubby snow gums in the Alpine country to the immensely tall and straight ones you’ll find lower down. I’m not going to get into a discussion of the various species here; suffice to say that there are lots of them and some of them are more suitable than others for use as antenna supports, as we shall see. 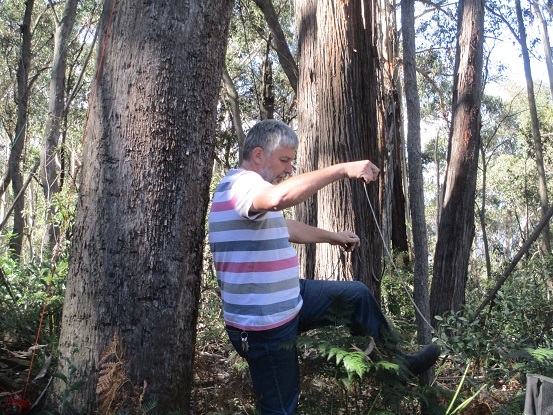 What we’re looking for is a tree with a branch extending from the trunk between 5 and 7 metres above the ground. Lower will still work but I wouldn’t recommend anything below 4 metres unless there really is no alternative. Higher than 10 metres starts to get hard to reach. Sure, you can use one of those fabulous gum trees that grow straight up with not a branch or even a twig within 30 metres of the ground, but it’s going to be a challenge to get a line up there. 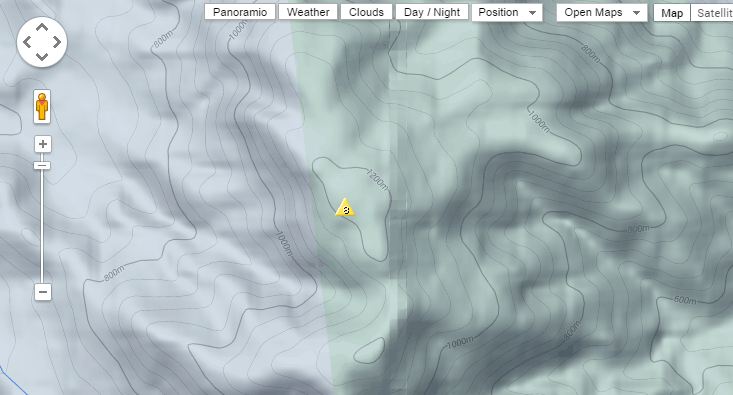 A word of caution here: many Summits are in State Forests and many of those consist of pine plantations. Pine trees are useless as antenna supports. They don’t have long branches and their foliage is too dense to get a line through it. Also, they hold a lot of moisture and function pretty well as RF attenuators. I’ve learned to avoid them. 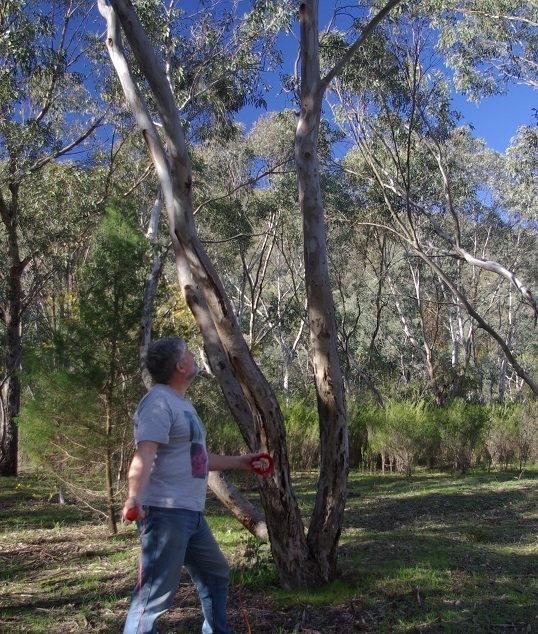 Another word of caution: Eucalypts have a knack of allowing “redundant” branches and twigs to die while the rest of the tree continues to thrive. These dead limbs can remain in place for years before they fall, but they become very brittle and in that condition they will drop at the slightest provocation. Don’t stand under one of these. They aren’t called “widow makers” for nothing. Also, don’t try to use one as an antenna support, even if it doesn’t look dangerous. Chances are, when you put a line over it, it will fall. Or worse, it will wait until you’re on the air making contacts and then it will fall. Then, assuming you haven’t been brained by the falling timber, you’ll find out how well (or otherwise) your antenna works when it’s lying on the ground. So, assuming you’ve got a conveniently located tree, in the activation zone, with a branch at the right height, what next? First, have a look at the lie of the land and consider where you’re going to set up your operating position. Can you get close enough to the proposed antenna support so that your antenna feedline will reach from the feedpoint to the radio? It’s no use hanging your antenna off a branch that extends above a blackberry thicket, for example, unless you’re happy to set up and operate among the thorns. Next, check out the foliage. Pick a part of the branch that isn’t surrounded by little twigs and clumps of leaves. They will snag your throwing line and either you won’t be able to get it over the branch, or you won’t be able to retrieve it after you’ve lobbed it up there. Next, check for snags and deep, sharply cleft forks that might catch and jam your throwing line. If you spot anything like this, avoid it. A wide, U-shaped fork, however, can be a very good point to aim for because you can be confident that your line will stay where you put it and won’t slip in the wind. You need something with a bit of weight to it that you can use to throw a line over your chosen branch. I use an arborist’s throw bag (16 ounce) for this. It’s a bright orange canvas bag filled with lead shot, the idea being that the bright colour makes it easy to see among the branches and the lead shot means it’s heavy for its size but quite soft and so won’t do (much) damage to anything it hits after you throw it. I acquired this after several expeditions on which I used whatever was to hand on the Summit to weight my throwing line. This has the advantage of less weight to carry, but the disadvantage is in the additional time and faffing about involved in finding a suitable rock and attaching it to the end of the throwing line. I discovered that small rocks are easy to attach but not heavy enough, while heavier ones are unwieldy and awkward to attach. The line itself is a 20 metre length of orange polypropylene builder’s twine with a spring clip on the end, for attaching the throw bag and the antenna centre insulator. The requirements for the line are that it’s relatively light weight, it’s slippery, it’s strong and its length is at least twice the height of the branch you want it to go over. It’s a good idea to choose a material that won’t tangle itself into a proverbial rat’s nest the moment it’s off the reel. 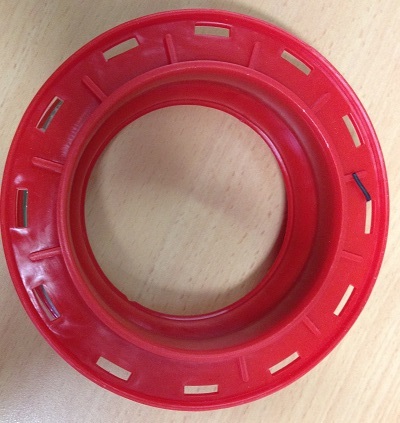 The line is wound on a 120mm hand-line reel from a fishing tackle supplier. Throwing the line: Safety First! To get the line over the branch, I clip the throw bag to the line and then position myself so that I’ve got a clear space to throw from. That is, there are no bushes or other stuff around my feet that might tangle the line or that I might trip over, and it’s clear overhead so that the line won’t get caught on anything as it goes over the chosen branch. I’ll stand 3 or 4 metres away from the target so that the trajectory will follow a gentle curve. I pull a good length of line off the reel – at least twice the height of the branch I’m aiming for – and let it lie on the ground in front of me. Then I put the reel down on the ground and step on it. The end of the line is attached to the reel and my foot will stop the whole thing from flying off into the undergrowth in the event that the throw goes awry, which is not unknown. Then I take the throw bag in my hand and lob it gently over the branch with an over-arm action, allowing the line to follow it. If it goes where I want it, the throw bag will probably end up lying on the ground with the line looped neatly over the branch above. Then I can pull the line back a bit, so that the throw bag is hanging at about waist height, and tie it off so that I can unclip the throw bag and clip the antenna centre insulator in its place. A couple of points to note: First, don’t get so distracted by getting the line over the branch that you forget to look where you’re putting your feet. It’s easy to stumble over debris on the ground or step in a rabbit hole if you wander around staring up into the branches. Also, if you have an assistant with you, make sure she or he is standing behind you when you throw the line. Although the throw bag is soft it’s quite heavy and in the wrong hands it would make a very effective cosh. If it lands on your Significant Other, even if it doesn’t do any physical damage, trust me, you’ll never hear the last of it. With the centre insulator clipped on and hanging at waist height, unreel the antenna to its full length so you can position both ends in suitable places. Then pull the antenna up to its final operating height and tie the ends of the antenna to handy anchor points such as bushes or tree trunks. Note: haul the feedpoint up to its operating height before you tie off the ends; you can probably figure out why. Generally, I find that with the feedpoint at 6-7m above ground, the links can be reached without having to lower the antenna. This makes for quick and easy band changes, so think about this when deciding on where to locate the antenna. There may be several possible places within the activation zone and it pays to have a look around on arrival and pick the best one. Retrieving the antenna and throwing line is the reverse of this process. Drop the feedpoint down to about waist height, untie the ends, wind up the antenna and unclip it from the throwing line. Then simply pull the line back over the branch, remembering to step back a bit so that the spring clip doesn’t fall on your head. Wind it on the reel, secure it with an elastic band and you’re done. Getting a line into a tree: Here’s an interesting article on tree climbing from an arborist’s perspective. It’s quite informative on getting a line into a tree in preparation for climbing, but also relevant to our needs.